3 bed holiday villa set on the beach with fabulous panoramic views of the bay. Elegant horizons offer exclusive beach front self-catering accommodation on the north west coast of Koh Chang,in the province of Trat. Our emphasis has been to design a new Koh Chang villa beach home that is both tranquil and relaxing yet still retain all the comforts you would expect in your own home. Set literally right on the Chang Noi beach,surrounded by powder white virginal sand, with panoramic views of the whole of Chang Noi bay. Mountain views all around this national park make this a truly wonderful paradise home,which you will want to return again and again. As a visitor to Thailand for 25 years, you could say i know the place pretty well, but still learning every day. As a really fed up uk family we decided to take the plunge and go for it and sell up in the uk and invest in this wonderful part of the world, and having two young boys too, non of us have regretted one minute of leaving the uk. Our goals are to create the perfect holiday villas for clients to visit and return. As an existing investor on the development, we saw this fantastic opportunity to be able to purchase a piece of land with usage of a unique Island, and create our own purpose built holiday villa. After renting here for a couple of years and also living in Thailand, we know what our clients look for. Check our reviews on our villa advert property 847526 and read what the customers say. This property from others on the development is located in a quiet spot along the beach away from the clubhouse and communal pool. Location plays a large part, and this villa has access to all amenities without a long trek. toilet, shower, Enlosed adjoining master bedroom. In all bedrooms, and lounge / kitchen. Bed linen change after 7 days. Parking at the rear of the villa. 20 mtr long garden straight onto the sandy beach having panoramic views over the bay. 3 man free private Kayak available at the end of the garden. Available at the beach club. 9 hole reversable par 3 pitch and putt available on the resort. 2 communal pools available, one in the Lagoona village, and one in the Marina village. Strictly smoking outdoors only. Maid service is 3 times per week, towel change once per week, bed linen once per week (All INCLUSIVE) Additional towels and bedding available and subject to the laundry charge. Electric and water read on check in and payable on departure to our on-site agent. Baby travelers cot and high chair also available. Min 7 nights stay between 21st Dec - 7th Jan.
We rented the property in January because it was a central location for our family to meet ... coming from Australia and England. It’s a perfect location. We have no hesitation in recommending it. We are a family of five with three children in their twenties. There was plenty to do if you wanted to ... and relaxing was easy too. Food wise ... Make sure you go to Blues Blues and The Souk. Best coffee and breakfast is at 15 Palms. Enjoy! The Villa is lovely and the location is perfect. Very, very comfortable and a wonderful spot! My sister, daughter and I could not have asked for a lovelier place to relax at the beach. The Villa is comfortable, and spacious. The beach is literally a walk out the front doors. It is equipped with everything you need in the kitchen and every room has its own air conditioning unit. Buying food is not difficult but does require some planning. There are several grocery stores in White Sands (Tesco, Big C and Marko). You can take a taxi. The reception fest at the resort is more than happy to call one for you. For quick items there is a 7-11 in the "village" and the resort shuttle will take you. The owner of the Villa and his staff were very helpful and responded to all of our questions promptly. We were thrilled with the Villa and would love to return! The beach is quiet and a perfect place to read, snooze and restore. My friend and I and our three teen daughters spent five days in this villa. Everything was fantastic. We were greeted and showed around the house by a representative of the owner and also given a map of the complex and lots of information and then left to enjoy. The view was breathtaking it really is right on the beach. The villa comes with a three person kayak which you can use when ever you want and the bay is perfect for it. The house was tidy, well appointed and had everything you need from bath and beach towels, a fully equipped kitchen. Each room has its own bathroom too. The complex itself is so great. Two gorgeous pools and we are in one of the restaurants and the food there was excellent too. We will absolutely be back again soon. Thank you for your review, we are very pleased to hear you enjoyed your stay in our villa. You are very welcome any time. We had a superb time at Elegant horizons, this truly is a superb villa with all amenities for the family holidaymaker. We had a smooth booking through Mike the owner, and were checked in on time and offered further services from his agent. Fab lounge with awesome views over the garden and bay. Four poster master bedroom facing the bay. We had evening barbeques most of our stay, but the clubhouse is great for food also. Thank you for taking the time to write a review, we are please you enjoyed your stay at our villa and hope you return to Koh Chang in the future. This Villa has been my home on the idyllic island of Koh Chang, each of the three times I have ventured to Thailand. I fell in love during my first stay at Elegant Horizons 5 years ago. The Villa is equipped with a beautiful open plan kitchen-dining room from which you can chillax and watch the most picturesque sunset. All the villa's amenities are strikinly modern and stylish. My Favorite thing is to wake-up when ever you see fit and wonder 20m to the biggest swimming pool the world has to offer and wake with a casual swim down the beach front and grab some breakfast down the clubhouse. It's great to hear a repeat client making a review. I remember after your first visit you said this place wants to be my best kept secret, now you have let it out. Hope your all well and look forward to seeing you again. Elegant Horizons offer exclusive self catering accommodation on the Siam-Royal-View Resort on the marine national park island of Koh Chang, situated in the province of Trat. Our emphasis has been to design a new Koh Chang villa beach house that is both tranquil and relaxing, but retain all the comforts that you would expect in your own home. Set literally right on the beach your garden steps down on to powder white virginal sand, and has panoramic views of the whole of Chang Noi bay. 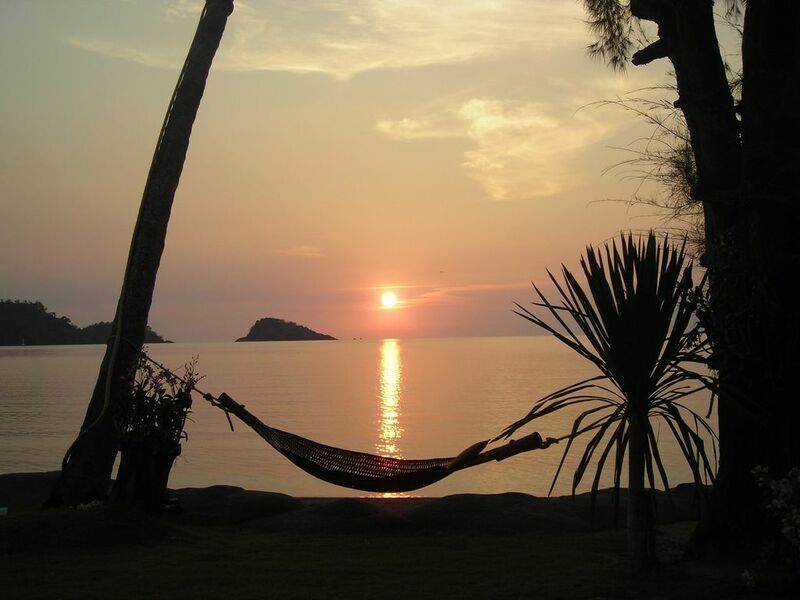 Koh Chang is one of Thailand's most sought after holiday destinations and you will want to return again and again. Golf: The local village of Kong Son 5 minutes away hosts a driving range for a small fee, although our resort hosts a professional 9 hole reversible pitch and putt golf course and golf shop for residents and guests alike. SPECIAL NOTES. Please Note = Minimum 1 WEEK booking for the XMAS & NEW YEAR period. Electricity and Water = The electricity and water meter is read on the clients check in, and is payable on check out in cash to our on-site agent at the supplier rate. Cancellation after 8 weeks 75% refund, 8 to 4 weeks 50% refund, and 4 weeks to arrival date = Zero refund. The booking deposit is non re-fundable. Over and above 8 persons, a fee of 700 bht per night, per person is applicable and payed on check in subject to approval.